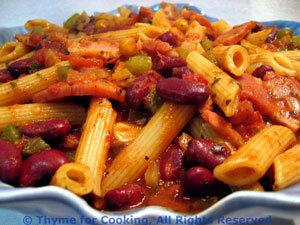 Spicy Beans and Ham with Pasta, easy dinner recipes. Prosciutto is well-known, but all Mediterranean countries have many varieties of local, dry-cured hams with a big range in prices. For this I buy the cheaper cuts in thick slices. A small amount adds a big flavor. Use the larger quantity of traditional pink or deli ham if you prefer. Or leave it out for a vegetarian version.